Badger 200-1 Model 200 Medium Airbrush Set. Brand New in Factory Packaging. In Stock Ships Within 24hrs. This is the Model 200 Medium Airbrush from Badger. Single action, internal mix, bottom feed. Offers the ease of single action operation while providing the fine spray pattern of internal mix paint atomization for professional results. Depressing the trigger releases a pre-set amount of color which can be regulated by turning a needle adjustment screw at the back of the airbrush handle. Once the desired paint flow is set, the airbrush will maintain the pre-set spray pattern until the user chooses to change it. Will spray inks, dyes, watercolors, goouaches, properly reduced acrylics, fabric paints, modeling paints, automotive lacquers and enamels, most ceramic stains and glazes, Air-Tex, Air-Opaque and MODELflex air brush colors. Color cup and one-piece jar adapter taper-fit for quick color changes. Self-lubricating needle bearing enables continuous proper paint flow and prevents needle wear. Head seal assures efficient air flow. 1/32" (0.8mm) to 2-1/2" (63mm) spray pattern. 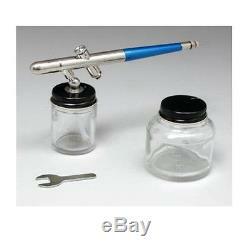 One Model 200 Airbrush with Medium Nozzle/Needle Attachable 3/4oz (22ml) Jar 2 Oz. (60ml) Jar with Cover Protective Cap Instruction Sheet. PSI: 20 to 50 lbs. Power requirements: at least 1/12 horsepower compressor. Please request for an invoice. The item "Badger 200-1 Model 200 Medium Airbrush Set" is in sale since Thursday, September 04, 2014. This item is in the category "Crafts\Art Supplies\Airbrushing". The seller is "power_hobby" and is located in Suffern, New York. This item can be shipped to United States, to all countries in Europe, to Canada, to Japan, to Australia.